3. Oktober, 2014 I am, in general, delighted by people. The chance to get to know more of them has been for me one of the greatest joys of this whole traveling experience. To get to know–by that, I don’t necessarily mean in the way of forming lasting friendships, though that is good too, but rather to encounter, to engage in dialogue, to come into contact with beings so marvelous that they slightly change, over the course of a conversation, the way you see the world. There was, for instance, the woman on whose couch I slept my first night in Mainz, who gave me potted plants and a beautiful Persian rug for my room. She restores paintings at the art museum in the city–Baroque graphics, mostly, and a few impressionistic watercolors. When I stopped by her workspace, she lovingly turned over two of the works on her dest and showed me the strip of brighter paint around the edges, as wide as a fingernail clipping. “That’s where the old frame was,” she said. “We’ll never get the color back. But aren’t they beautiful? From a private collection–what a treasure.” From the amount of care in her voice, she could have been talking about a child or a dear friend. Or a few days ago, the elderly gentleman in the cafe in the city, a composer of music for silent films–German expressionist films of the 1920s, to be exact, the same works I had studied and fallen in love with last semester. He was a talker. He came under the spell of Richard Wagner as a young boy and can still play all the piano reductions. He had read the entire opuses of both Robert Musil and Thomas Mann. His favorite scene Musil’s The Man Without Qualities is where Ulrich shoots the grand piano to pieces with his pistol. And he knew someone in Austria who had a portrait of the family estate painted by Hitler. “Das ist Erzählung–that’s story,” he said. 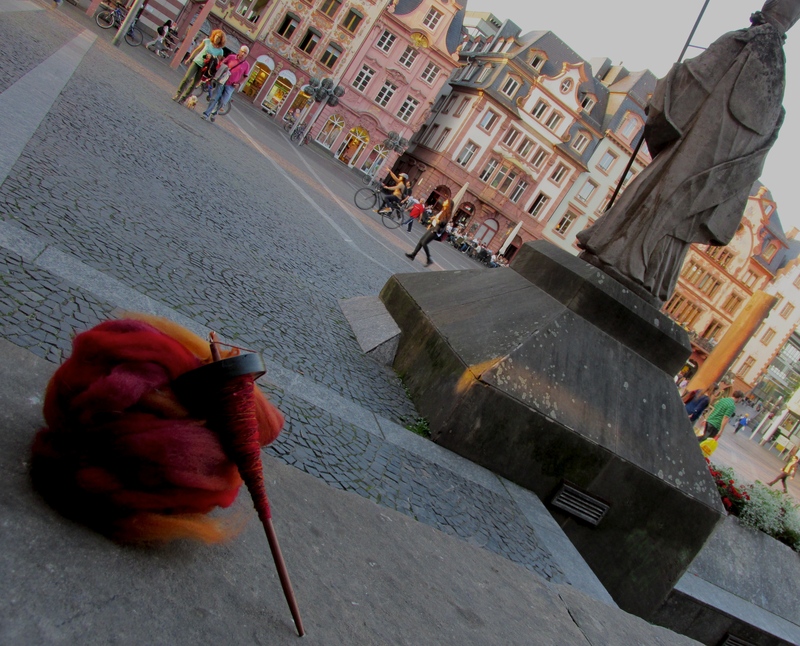 Or just this evening, there was a local bum sitting near me in the Old City, where I was leaning on the edge of a fountain and spinning wool. “Is that a spindle?” he said, and without waiting for me to answer launched into a monologue on the effects of handwork on the soul in a rushed world, drawing in references to the Virtuous Woman in Proverbs and the Senecan concept of internal rest, speaking of the necessity of practicing stillness in order to live well and to prepare for death. “Das Meer der verzehrten Menschen ist sehr groß,” he said. “The see of wasted men is vast.” I thought, he has voice of an actor and the syntax of a poet or a professor of literature. But before I could ask him how he came to speak like that, he turned around and walked off. 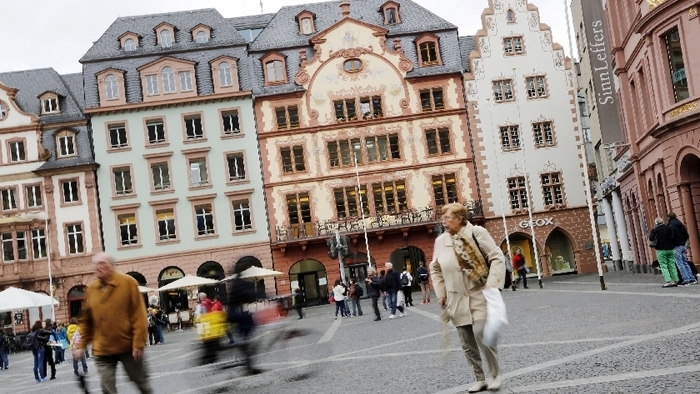 This entry was tagged city, Deutschland, Germany, literature, Mainz, Marktplatz, People, philosophy, Shakespeare. Bookmark the permalink. Oh Emily – what wonders you create! I really enjoy your posts, as does tom. He reads them all too. ‘The sea of wasted men is vast’ – indeed! What was the filmmaker’s name, per chance?